Subsequent to the International Conference the Urb.Energy partner Competence Center of Major Housing Estates, together with Planergemeinschaft Dubach, Kohlbrenner and BBP Consult, guided the participants through the neighbourhoods Frankfurter Allee Süd (large housing estate) and Kaskelkiez (historic building area), which are located close to the conference venue. Firstly, good practice of energy efficient measures and secondly, their close connection to integrated neighbourhood development were explained. Kaskelkiez has been improved considerably but still socially acceptable during the past 20 years. During the walking tour the participants gained impressions of the redesign of public space, including streetscapes, green spaces and playgrounds, all of which were planned through participative approaches. Against the background of regulations of monument conservation as well as a complicated owner structure, energy efficient refurbishment and modernisation of residential buildings were illustrated, including exemplary uses of renewable energies. Also the planning approaches for a severe deficit of social and culture infrastructure in a first shrinking and later growing neighbourhood could be shown on site. 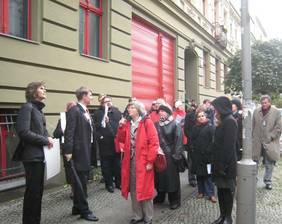 In Frankfurter Allee Süd some different issues complemented the walking tour, among them the allocation of land, the redesign of public and private green, social and educational measures and (energy efficient) improvement of social infrastructure. At several stations of the tour constructional measures at prefabricated buildings and measures in the residential surrounding were shown, such as tenants' gardens and -terraces, the redesign of passage ways and entrance areas as well as the classification and management of parking spaces. Additionally, two key projects could be visited: a newly built neighbourhood centre and Europe's largest low-energy residential building in Schulze-Boysen-Straße. The 2,5-hour excursion finished with a presentation by the portfolio manager of HOWOGE housing association in the local customer centre.